Ice cream bars have become increasingly popular over recent years. This is probably because they’re not just fun for kids; they’re great for adults too! Depending on what you’re looking for, there’s likely going to be a perfect ice cream bar for your wedding. First, let’s through a few ideas on what some of the best ice cream bars around I’ve seen so far. This one is a good example of an option you could take if you’re having a larger wedding (50 people +). The majority of wedding caterers will help you design this, but it can be fun to do it all yourself. The benefit of using a big ice cream bar like this one is that for the most part, people can help themselves. This will give your friends and family the wow! factor, especially the kids (as you can see in the video!). The one negative about having a huge ice cream bars with lots of different toppings and ice cream types is that you’re likely to have a lot left over, which if you’re like me is a nightmare. I haaate waste, so there’s nothing worse than thinking about throwing away the rainbow sprinkles if no one decided to eat them. Ultimately, this is a great choice if you’re looking for something to impress your friends and family. If you like big scoops, then big bowls and big spoons are the way to go! This is a great idea much like the first video, giving your friends and family the opportunity to help themselves. WARNING: This one will only work in the summer! If you’re having your wedding outdoors, then it can be a good option to go for sundae glasses for your ice cream. This is really just for aesthetics, but you can’t deny it looks great! Another idea you could opt for is to invite your very own ice cream man to serve ice cream at your wedding! This is a great idea if you don’t feel like you’re going to use everything, as the majority of the time you can find an ice cream man in your area will to turn up and use his stock. Another idea with can add to the cuteness factor of the whole thing is to let your kids – or other peoples kids – serve the ice cream! Here, you can see they got their kids to charge 5c and 10c an ice cream – super cute! Now, an ice cream bar doesn’t always have to be a massive deal. If you want to downsize things, then you could just opt for a smaller table filled with different option for your guests. This one is my favorite – it’s the cutest! Head over to Crafty Wedding for some other ideas that are almost as cute as this one. If you don’t mind things getting a bit cheesy, then this could be a good one for you too. You’re the sprinkles on my ice cream? You’re not going to get much cheesier than that (and that’s just how we like it, too!). The Rustic look just seems to work with ice cream, don’t ask me why. Going for a rustic look will likely suit the theme of any wedding, unless you’re going for something out of the box. Styling your ice cream cups is one of the easier ways to help make your wedding unique to you. These ones are super cute! If this isn’t the cutest thing you’ve ever seen, then I don’t want to know you! Only kidding, but you’d be hard pressed to find something cuter than this spoon set. Everything can be cute customized! From the ice cream itself to the cones you’re using to eat, to the spoons you might be using to eat them! Everything can be customized in a cute way. A good option is to make this part of your wedding pack – include a personally customized spoon for all your guests! If you want to liven things up a bit, you could opt for some really unique flavors that you might not have tried before. Check out a list of the best toppings and see if there’s anything that tickles your fancy. If you want to make things super simple for your guests, then you could opt to pre scoop your ice cream in advance. Doing this will save a lot of time and make things much easier for your guests to get enough ice cream for them. If you can get the temperature right, then chocolate bowls can be a really great choice to give your guests something unique. This is a great idea for anyone looking for something a little different! Overall, it’s really down to use to decide which of these may be best for your wedding. It’s a good idea to contact a local caterer or ice cream specialist to find out what may be the easiest option for you. When talking about the different ice cream types, this can usually be answered pretty simply. There aren’t an abundance of different types of ice cream; more so, that there are many different variations of ice cream. So whether you’re looking to understand the different types of ice cream there are in terms of ingredients, or you’re looking to see what variations of ice cream there are around the world, this list has everything you need. Firstly, let’s have a look at what the ‘big four’ that are usually considered as a variation of ice cream. Foe me, a stereotypical ice cream is made primarily cream, with a little milk. Different recipes will use different quantities of each ingredient, and you might find that some recipes will use for milk. But to be defined as ice cream, it must have a 10% milkfat content. In addition to cream and milk, a traditional ice cream will have sugar and things like vanilla extract. If you’re making your own ice cream, then you have a significant amount of control over the other ingredients. But if you’re buying other brands, then you lose control of this and you’ll likely find other ingredients in store bought ice cream that help to extend it’s shelf life. Essentially, gelato is just the same as ice cream but it has a slightly higher milk percentage. This makes it have a slightly lower fat content than ice cream, and will results in a creamier experience. Whilst it might not be a big deal to mislabel an ice cream in the United States, I’d better warn you; don’t go to Italy and mislabel their ice creams. Trust me, they’ll take it personally! A traditional sorbet is pretty easy to understand; it only has three ingredients! Sorbet is made from fruit puree, sugar and water – that’s it! Sorbet is usually a great option if you’re looking for a hypoallergenic dessert, as it lacks many different ingredients that may upset your stomach. In reality, the Sorbet is really where the roots of ice cream began back many years ago, where the term sorbet came from the Arabic “Sharabt“. Sherbet is to sorbet, as gelato is to ice cream. It is essentially the same as sorbet in the context that it’s based primarily on fruit puree/juices. But with sherbet, you’ll have a little milk added to the fruit. Not much; the milk fat content should between 1 and 2% of the dessert. Simple, right? Well, we can dig a little deeper into this. If we then consider ice cream our ice cream, there are various different things that you can do to alter the ingredients in your dessert. Lactose free ice cream is increasingly popular amongst those who have milk allergies. Not just for adults, but it’s important to know whether your child is lactose intolerant. To do this, the recommended way is usually to cut out dairy foods for a period of time – lactose free ice cream can be a great way to give your kids an alternative. Plus, I’ll admit; I’m not lactose intolerant, but sometimes I’ll opt for lactose free options anyway! There are some excellent coconut and soy milk variations of ice cream that I absolutely adore. Gluten free ice cream… does ice cream even contain gluten anyway? Well yes, actually. If you look at the brand Bluebell – who make some delicious ice creams, by the way – then the majority of their ice cream recipes use wheat. So if you’re celiac, you should avoid this brand entirely. Whereas, you’ll also have to consider that the gluten elements of the ice cream may not be in the ice cream itself. They are more often found in the other parts of the dessert e.g. the cookies or the strawberry pieces that are in your dessert. Sugar free ice cream isn’t as commonly found as the others, but you can still find some sugar free ice creams around. You have to remember that these ice creams will usually have a sugar substitute in their ice creams, which may not agree with your system. Examples of sugar substitutes are monk fruit extract and stevia, which are good options if you’re trying to avoid normal sugar. The production of soft ice cream is entirely different than that of regular ice cream. This makes a huge difference in the way that the ice cream’s texture is built up, ending up in a softer ice cream. If you like soft pistachio ice cream then you could try Talenti. Neapolitan ice cream has been popular in the United States since the late 1800s, when the Italians brought over this delicious dessert. It’s stereotypically strawberry, chocolate and vanilla ice cream together – but split separately from each other. There are different variations of a Neapolitan Ice cream where the flavors are adapted. Sometimes, you might see the strawberry switched out for cherry ice cream, or the chocolate switched out for another flavor – but a traditional Neopolitan is the S,C and V combo. Vanilla gets some bad pretty as the worst flavor, but it’s actually still the most popular ice cream flavor that there is! The most popular adaption of a Neapolitan Ice Cream is Spumoni. Actually, it’s pretty clear that Neapolitan ice cream is actually a Naples variation of Spumoni that became extremely popular in the United States in the late 1800s. This is because Spumoni represents the colors of the Italian flag; it’s traditionally cherry (red), vanilla (white) and pistachio (green). Sometimes, you might see the vanilla section using chocolate instead (or as well as), but this is only for taste purposes. Anyway, this dessert was a favorite in the mid-to-late 1800s and it became popular, though it’s far lesser known than the Neapolitan is nowadays. Commonly thought of as being the exact same as sorbet, sorbetto is actually slightly different. This is because it’s typically made to be slightly creamier than normal sorbet by using a higher percentage of fruits, which results in a creamier texture. Of course, to the average man you’re unlikely to notice the difference between a sorbet and a sorbetto. But ask any Italian and I’m sure they can tell you the difference pretty easily. French Ice Cream deserves it’s own section as it’s pretty different in taste and texture than what you’d get from a typical ice cream. This type of ice cream actually has a texture more similar to custard. This is because it uses eggs instead of cream, which gives it a completely different texture than what you’d get with traditional/American ice cream. Interestingly enough, it’s commonly debated whether the Italians or the French really created who made the ice cream that we call ice cream today. There’s many ‘myths’ which we aren’t entirely sure of – Charles the I having his own personal ice cream maker assistant is probably my favorite. Dondumra, which literally is translated as freezing in Turkish, is a variation of ice cream that isn’t much different from what you’re probably used to. The only difference really is the elasticity, which makes more solid and quite resistant to melting. This is done by adding salep, which is literally the ground up roots of orchid bulbs. This, along with some resin called Mastic, give this ice cream a chewier and more solid feel. If you’re the type of person to take an age eating your ice cream, then maybe this one would be a perfect option for you! If you want to try something totally different, then you could consider trying some mochi ice cream. Mochi is a glutinous rice that’s usually made into small ricecakes – think sushi rice, but much stickier. This rice is then formed around an ice cream filling of your choice. Traditionally, you’ll see the plainer flavors like chocolate and vanilla being used, but you can experiment with this. You’ll find mochi ice cream in many stores around the US and globally, but surprisingly it’s actually relatively young in it’s inception. Essentially, a thin batter is pressed through a sieve to produce these vermicelli like noodley strips that are made from starches. They’re then placed in ice water, before being topped with various fruit syrups of your choosing. This is much closer to the original sherbet concept which likely originated in the middle east hundreds and hundreds of years ago. Spaghettieis, or spaghetti ice cream, is a German dessert which is pretty much exactly as it’s described. In reality, it’s more of a super cool preparation method than an actual difference in the way the ice cream is made. The usual method for making spaghettieis is just pushing vanilla ice cream through a potato ricer to make it into a noodle appearance. From there, it’s usually layed onto a bed of whipped cream and topped with a straberry or cherry sauce (which is used to make it look like bolognese sauce!). Then, you’ll usually find that some sort of white chocolate is used to look like parmesan cheese sprinkled over the top, though you might find something else is used like desiccated coconut. Whilst many think that fried ice cream is only popular in China, it’s actually pretty popular all over Asia (you can find it in Japan and most South East Asian countries too). Some say that it originated in the United States, though the likelihood is that it was first produced somewhere in Asia – perhaps by a tempura restaurant. Essentially, it’s exactly as it says; it’s regular ice cream in a deep fried coating. If you’re wondering how this is even possible, you’re certainly not alone! The temperature of the ice cream must be significantly below what the usual temperature is for an ice cream to be able to put it into a fryer. Some restaurants usually like to coat the ice cream in other materials like cornflakes to help this process, too. It seems only fair to include some other variations of ice creams made in Asia. Sorbetes is a Filipino variation of ice cream, and though it’s named similar to sorbet, it’s not the same thing at all. Nicknamed ‘dirty ice cream’ because it’s exposed to the elements in the air – though it’s not really that dirty. The main difference between sorbetes and regular ice cream is that it’s made with coconut cream (kakang gata), which gives it a much sweeter taste than your traditional ice cream. The J Cone is something you might have seen if you live in the United States, as it travelled there from Korea for the first time a fair few years ago now. Essentially, a J Cone is just a J-shaped tube made from corn that’s filled with soft serve ice cream. It’s pretty similar to a churro, but whereas churros are served alone or with other accompaniments, you’re unlikely to find a J Cone without ice cream. Whilst the ice cream cone is the most common types of ice cream that you’ll see sold on the street, there are other versions. Personally, I like the cones after they were invented in the early 1900s, but to each their own. If I’m not eating an ice cream cone, I’ve no hesitation to opt for a delicious ice cream stick. This is particularly because it’s relatively easy to find some healthy ice cream bars, which is perfect if you’re on a diet. Although they say the ice cream sundae was invented on a sundae, we’re not entirely sure if this is true. A traditional sundae is just vanilla ice cream topped with a bit of whipped cream, syrup and topped with a delicious maraschino cherry. Whilst this isn’t the healthiest thing in the world, it’s surely one of the most delicious. Well, I think so anyway. You really can’t get much better than combining two of the best things in the world together – ice cream and cake. Mmmmm. Vendors will often just serve ice cream on it’s own in a little tub of bucket for you to enjoy. This can be a great ay to cut calories too, as you don’t need to worry about the excess calories in the cone. Here’s just a few ideas on what you can do with ice cream – there are tons of possibilities for you to choose from that are all completely unique! It’s down to you to have a look at the different types of ice cream and see which ones suit you best. Have you ever wondered what ice cream you can pick up on the go that won’t destroy your diet? Well, you’ll likely want to know what the healthiest fast food ice cream is. With less and less restaurants serving ice cream in favour of milkshakes and thickshakes, it’s harder and harder to find a decent ice cream. But don’t despair; I’m here to help. With the majority of Starbucks getting rid of their introduction of ice cream, is this a sign that people don’t really want ice cream as their dessert any longer? Or is it just a sign that serving ice cream and coffee together doesn’t work the same as after a full meal (lol)? For this question, we’re looking at the staples of the menu – not the occasional promotional ice cream that these fast food restaurants may features. We want reliability in our ice cream – you can’t offer me a limited edition peanut butter fudge deluxe uber delicious sundae one day, then take it away the next. It’s just not fair. The King. The ruler of them all. Undoubtedly the most popular dessert in the United States, the McFlurry commands respect by all those who choose to eat it. No, but seriously, the McFlurry is an extremely popular option all around the world. Now, it’s difficult to fit into your dieting plans, but that doesn’t mean that it’s impossible. If you’re in the United States, you can always opt for a snack size McFlurry to save yourself some cals, but if you’re in Europe or elsewhere you’re unlikely to have that option. A vanilla frosty is one of the most popular desserts in the United States. They were instantly popular since their inception back in the 60’s; Wendy’s still serve hundreds of millions of delicious Frosty’s every year. Unfortunately, Frosty’s aren’t still 35 cents as they were when they were first released. Whilst you might not think that the Blizzard is one of the better options on the menu, it’s actually much lower in calories than some of the other options you can choose. The Blizzard is quite a bit younger than the Frosty, having only been around since the mid 80’s. If you’re looking to try one of the various promotional offers that they create, be sure to check the calories first! Whilst the icedream might not give you the same excitement as some of the other ice creams that I’ve listed, it’s pretty darn low in calories! This is mainly because it’s very plain, but it still hits the right spot if you’re after a healthy dessert option. I don’t know about you, but where I’m located you get the option to ask for your icedream served in a cup as opposed to a cone. If you can, do this; you can save yourself 50 calories! If you’re not in the UK, you might not be familiar with a KFC Krushem. They’re essentially like a thick shake, but they’re so thick that they’re basically an ice cream. The calories vary a lot between the different types, so opt for maltesers if you’re watching the calories. If you’re interested in making one of these Krushem’s at home, check out this super easy to follow recipe! The Burger King Chocolate sundae is a must for those who loves a traditional ice cream. Whilst it lacks the complexity of a mcflurry, it’s perfect if you just want a two flavor dessert to tingle the tastebuds. Yes, the picture featured is an oreo sundae, which they no longer serve at my local BK. Sad face. Honestly, I don’t really like putting Sonic in a list of ‘healthiest’ ice creams. If you go to Sonic, you should really treat yourself and take advantage of all the toppings they offer! Now remember, the 250 calories refers to the plain ice cream cone. Any toppings you choose to add to that are your own responsibility, don’t blame me! Honourable mention goes out to Pizza Hut and Tim Hortons, who we couldn’t really include in the list. Why? Well, if you go to the majority of the fast food restaurants, they give you the opportunity to do it yourself. For this reason, it’s literally impossible to count calories! One of the better ways to keep it healthy is to completely ignore fast food ice cream and make it yourself. This way, you know exactly what’s going into your stomach. I know it seems off to have a list of the healthiest fast food ice creams – in many ways, you’d probably be better of just forgetting about your diet for one day and getting back on the wagon tomorrow. Remember to allow yourself an (ice cream) break every now and then, otherwise you’ll end up getting burned out on your diet anyways! So, you want to know a bit more about Neapolitan ice cream huh? Well, you’re in the right place. The tri-colored dessert has dramatically decreased in popularity over recent years in favour of newer flavors, but there are still those out there who love themselves a good helping of the Italian favorite. Generally, Neapolitan ice cream refers to three different ice cream flavors served in the same tub. Traditionally, these flavors are chocolate, strawberry and vanilla. Though you may see different variations of this, it’s not true neapolitan ice cream unless it’s these three specific flavors. The flavors should also be clearly separate from each other, though some ice cream makers do tend not to do this. Now, we know that the basis ice cream travelled over to Europe and Italy in approximately the 1600s. This was developed further by the Italians, who then developed Neapolitan ice cream in the early 1800s. Of course, Neapolitan ice cream originated in Naples, Italy. It wasn’t until the late 1800s, when Neapolitans (that’s what you call people from Naples, in case you’re wondering!) moved over to America and brought this ice cream into a new realm. Of course upon reaching America, it was named Neapolitan in respect to those who had brought this delicious dessert to the US. It’s unknown who specifically invented Neapolitan ice cream. It was created to fulfil customer demands of a mixture of the three most popular flavors at the time (and still today); chocolate, strawberry and vanilla. It’s commonly thought that the ice cream may have been created, or at least further established, by Neapolitan Giuseppe Tortoni. When Tortoni travelled to Paris as a young man in the early 1800s, he brought many ideas for cold desserts with him from his home City; Neapolitan ice cream being one of them. Spumoni is a commonly known variation of Neapolitan Ice cream that you might have heard of before, though it’s unclear whether it was around before traditional Neapolitan. It takes the same format as Neapolitan ice cream, but instead of the chocolate and strawberry flavors, cherry and pistachio ice cream is used instead. This gives the representation of the Italian flag, so is commonly associated with Italy and it’s natives (as Italians are very proud people!). You might find sometimes that a chocolate layer is added in addition or, or instead of, the vanilla in a spumoni. An Example of a Spumoni Cake! Generally, Neapolitan ice cream is made the same way that you’d make any other sort of ice cream initially. This means that the strawberry, chocolate and vanilla parts of the ice cream are made as normal; the difficult part of Neapolitan ice cream comes to when you go to put it into the tubs. One of the more common useless questions that you might ask yourself is how exactly do they get the Neapolitan ice cream into tubs? I mean, do they make the ice cream first and then stack it together? Well, no. With Neapolitan ice cream, the most common method that I’ve seen used to make it is actually fairly simple – it’s all about the nozzle! Basically, three pipes are all put into tubs containing the different flavors of ice cream. They then are pushed through a three pronged nozzle, which is shaped the same way that the Italian flag is. This is all quite a quick process, and the ice cream must be put at a optimum temperature to avoid it merging with the other flavors whilst in the tub. It’s then frozen for between 8-10 hours to get it nice and cold, so that it can be sent out to stores! The amount of calories in a Neapolitan ice cream is really dependent on which brand you opt for. i’ve seen some low fat Neapolitans that look pretty tasty, so it’s difficult to make a blanket statement. It also depends on how much of each flavor that you eat! Normally, chocolate will have more calories than vanilla, and vanilla with have more calories than strawberry. This isn’t a hard rule, but if you look at the majority of basic ice creams, this is what you’ll find. Usually because the chcolate and vanilla ice creams have a higher fat content than what you’d get in a strawberry ice cream. If you want to make a Neapolitan ice cream yourself, then be my guest! Be warned that you probably won’t be able to separate the flavors as easily as they do in store bought ice cream. Check here if you want to find out how to make ice cream from scratch. Of course this is subjective to each individual, but I can talk about some of the Neapolitan ice cream brands that I’ve tried and let you know if they were good or not! Turkey Hill Neapolitan Ice Cream – One of my favorite brands of Neapolitan is made by Turkey Hill. Their option is fantastic if you’re looking for a gluten free neapolitan ice cream, as there are many ont he market that aren’t gluten free. Walmart Neapolitan Ice Cream – Whilst it’s not my favorite, I was pretty surprised at the quality of the Walmart Ice cream in comparison to some of the other ice creams I’ve tried from them. If you’re looking for something cheap and cheerful, then look no further than something from Walmart! Edy’s Neapolitan Ice Cream – Edy’s Neapolitan is one of the best around. I like the Edy’s brand in general, and they make some of the best ice creams around. My favorite from them is probably their Orange Sherbet, which is one of the best orange sherbets around. It really depends on the recipe or brand that you’re going to opt for when you’re choosing your ice cream. There are really some great gluten free ice creams around – I’ve mentioned a good example above in the Turkey Hill Neapolitan Ice Cream. Whilst it might not be the healthiest ice cream around, you can find variations of Neapolitan ice cream that are lower in calories than some others. When you’re looking for a healthy option, it’s a good idea to opt for ice creams that are lower in fat. This is mainly because it’s really hard to find low sugar ice creams – it’s one of the most important ingredients of a good ice cream! However with fat, you can tend to find ice creams that have a lower fat content, though that may be considered technically as a gelato. This really depends on you! Many people say that you’re not really eating a Neapolitan ice cream unless you’re combining a bit of each flavor together, but I say each to their own. Stick with whatever you prefer and you can’t go wrong! In Australia, the Neapolitan Cake is far more popular than the Neapolitan Ice Cream. Check here for the awesome recipe to make this cake! Although around the world it’s commonly known as Neapolitan Ice Cream, if you’re talking about a Neapolitan over in Sydney, it’s likely that people will understand you’re talking about the cake. It’s sometimes referred to as Harlequin Ice Cream. The reason for this? Well as you might expect, it’s likely that people referred to this ice cream as Harlequin because of the multi colored clothing that Harlequin Jokers/Jesters wore when they were performing in Italian theatre. Yes, that is where the name Harley Quinn comes from. It’s generally accepted the first recorded Neapolitan Ice Cream recipe was made in 1839. Although there’s little more than anecdotal evidence on the origins of Neapolitan ice cream, the first recipe was likely recorded in 1839 and dedicated to German Nobleman Furst Hermann by another Prussian household. We’re still sure that the Neapolitan was around long before this, though! Hopefully now, you have a slightly better idea on about Neapolitan ice cream and where it really started from. I also hope I’ve given you a bit of a better idea about where you can find the best Neapolitan Ice Creams around – to me it seems like it’s dying out! This is probably due to the abundance of new ice creams being offered by Ben & Jerry’s – there’s likely less demand with all the new flavors coming out. Though if you’re like me, you’ll always want the occasional Neapolitan ice cream to get the best of all three worlds. If you are looking at getting a large ice cream maker, then this is definitely one made by Nostalgia is definitely one that you should consider. The majority of ice cream makers that I see for sale are for 1.5 quart or 2 quart ice cream makers. I don’t know about you, but that’s just not enough! If I’m making ice cream at home, I want a bit more so that I can save some delicious ice cream for later on in the week! If you are after a smaller ice cream maker, then you could consider the ICE-21 (check my review here!) as this is my pick of the bunch for cheap, smaller ice cream makers. Anyway, let’s look at the Nostalgia and see why I think it’s one of the best options for a large ice cream maker. The Nostalgia is much larger than your standard ice cream maker. A standard ice cream maker is usually 1.5 quarts, so this is double the size. This is great for larger families and those that are looking for something that will produce a heck of a lot of ice cream. It’s not so big however, that it’s going to get in the way of your kitchen and obstruct the other equipment. I have to admit that I have a bit of a soft spot for manual ice cream makers, but that doesn’t mean I’m adverse to a top quality electric one like this. They are usually much easier for your everyday folk to use, as you don’t need to spend lots of time manually churning your ice cream. It’s my pet peeve that people create ice cream maker that are difficult to clean. It’s so unnecessary to have loads of crevices for ice cream to get stuck.. why do it?! Well, at least you don’t need to worry about that with the Nostalgia, as it’s extremely easy to clean. All it takes is a quick soak and wipe down after use and it’ll be good to go again! Did I say that it’s my pet peeve when it’s difficult to clean an ice cream maker? Well, this is a close second. With many ice cream makers you have to pre freeze to ensure that it’s cold enough for your ice cream to be churned properly. You DON’T need to worry about this with the Nostalgia, as you can do this easily wiht pre freezing. You will need to lays the edges of this ice cream maker with salt and ice, which isn’t the norm. With other ice cream makers, you can add the salt after, but it doesn’t really make much of a difference. Still, I thought that I had better mention this because it does affect the way that you will produce ice cream. To be perfectly honest with you, I don’t really know why this “Nostalgia” ice cream maker is commended so much as being old fashioned. Sure, it looks vintage but it certainly doesn’t work in a vintage way – I mean come on, it’s electric! Anyway, I guess it’s old fashioned appearance does make it look good, so if this is something that concerns you then the Nostalgia will undoubtedly look good in your kitchen. One of the main reasons that I like this ice cream maker is that it’s much faster at making ice cream than a regular ice cream maker. This is because the churning mechanism works faster, without affecting the quality of the ice cream in general. Mmm, delicious! The safety mechanisms in this ice cream maker make it suitable for children to use, too. This is one of the reasons that I’ve picked it as my favorite, because I can use it with my grandchildren without worrying about them hurting their fingers. Many ice cream makers only intend for you to use their ice cream mixes. This is pretty much the same with this one, as they advertise their own ice cream mixtures pretty vigorously. This doesn’t mean to say you cannot use other ice cream mixes; you can! This ice cream maker will work well with a wide variety of different mixes, so don’t worry if you think you can only use it with Nostalgia products. The size is a major plus for this ice cream maker. 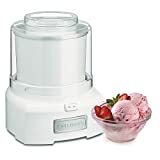 If you want to make enough ice cream to last you for a few weeks, then this one would be a fantastic choice because although there’s an abundance of smaller ice cream makers on the market, there isn’t too many available at four quarts or more. You don’t need to chill the ice cream tub before you use it. Some ice cream makers require that you chill the tub first or leave it in the freezer for a few hours, but that isn’t really necessary with this one – although it may give you better results. Electric ice cream makers are a great choice if you don’t want to do the mixing yourself. You won’t need to wait too long for this maker to produce you a decent quality ice cream. If you have a small kitchen, then this isn’t going to be the best option for you. It takes up a significant amount of space in your kitchen, which eventually can get pretty annoying. It’s not a heavy duty ice cream maker by any means. What does this imply? Well, you don’t want to leave it in the freezer for to long because it may make it more difficult for you to scoop the ice cream out of the barrel. Overall, I’d say that this is a fantastic ice cream maker if you’re looking to have some fun with the kids and play around. It’s very simple to use, so you don’t need to worry about your kids having difficulty using it. A very good option if you want a basic, relatively cheap ice cream maker that gets the job done. I don’t know about you, but my Instagram timeline has been filled with people eating Enlightened Ice Cream. It’s like suddenly out of nowhere, Enlightened has become the new Ben & Jerrys for fitness models! Whilst I like the idea that you can enjoy a super low calorie dessert, I was slightly dubious that it ws really going to be like ice cream – or even frozen yoghurt, for that matter. After reading the ingredients list, I was baffled at how this dessert could even be the same texture as ice cream. Now, I’ll be honest and say that I only tried that plain vanilla flavor, so I can only really speak on that experience. I’m pretty sure that the chocolate flavors will probably taste a little different, but I’m yet to try those flavors so I’ll save them for a later review a little further down the line. The reason that I said I don’t know how this can be similar to ice cream? Well, the ingredients of course! It’s primary ingredient is skim milk; fine, that’s pretty normal for a diet ice cream nowadays. But, it’s least used ingredients are sugar and cream – the foundation of any good ice cream! Instead of using sugar, Enlightened use a mixture of monk fruit extract and erythitol – both naturally occurring sweeteners that you’re going to find in a lot of dieting products (less so with monk fruit extract, but it’s becoming more popular). And instead of using cream, Enlightened use Milk Protein Isolate; this helps the thicken the dessert, as well as increase the protein content of the ice cream. Now I’ll admit, I did read some online reviews before eating this ice cream to check the general consensus. Whilst the majority of reviews I read were saying “OMG this is AMAZING!” because they had obviously been sent the ice cream for free, there were a few honest ones amongst them. The honest reviews seemed to imply that this ice cream wasn’t as creamy as what you may get with a regular ice cream. I’d probably disagree with this – I found it to be extremely creamy! This sis likely due to the amount of protein isolate that’s used, which adds to the texture of the dessert. The taste of the ice cream is pretty bland, in my opinion. I guess I did just try the plain vanilla version, so I can’t speak for all of the flavors but yeah.. it didn’t taste as good as a regular ice cream, which I’m guessing is the goal of these protein ice creams that have become more and more popular recently. This is likely because it doesn’t have the sugar and cream that you’d use in a regular ice cream. So, I can’t really argue with the fact that this doesn’t taste like a regular ice cream. Like many foods that try and put a healthy spin on things, it’s literally impossible to maintain the same taste with this. That doesn’t necessarily mean to say that the taste of ice cream is bad, by the way. It’s still pretty good. But, it’s just not quite as good as what you’d get with a regular ice cream, in my opinion. To conclude, in all honesty I probably wouldn’t consider purchasing this ice cream again. I love the fact that it’s so low in calories, but for that that isn’t really worth the lack of taste. I’d much prefer to have a higher calorie ice cream and cut the calories out somewhere else! Is it okay to eat ice cream when pregnant? One of the most common cravings to eat when you’re pregnant is undoubtedly ice cream. Don’t ask me why; no one really knows why such specific cravings occur, but they’re usually related to eating high carbohydrate and fatty foods like ice cream. But is it okay to eat ice cream when you’re pregnant? It’s thought that the reason that women crave ice cream during pregnancy is that psychologically, the thought of the sweetness of the ice cream is what you’re actually craving more than the taste. During pregnancy, a woman’s body will need to increase more than 30% in it’s volume of blood. This is to help accommodate the new baby. Eating sweet and salty foods can help to increase the blood flow throughout your body, which is likely why your brain craves these sweet and salty foods. But, what about the effects of eating ice cream whilst your pregnant? Will this have any long term impact on your child’s health? Generally, you should absolutely fine eating ice cream whilst you’re pregnant. This is because any milk and eggs that may be contained in your ice cream have been pasteurized by the time that you’re going to eat them. This means that you don’t run the risk of getting salmonella poisoning, which is something you definitely need to avoid whilst you’re pregnant. I think that the reason the majority of people question whether it’s okay to eat ice cream whilst pregnant is that they assume that dairy products may cause an issue for a baby. This is probably because it’s known that some soft cheeses can cause issues during pregnancy. And of course, you need to be super careful when eating eggs during your pregnancy. This is because certain eggs you eat give you the risk of getting salmonella poisoning – make sure your eggs are cooked thoroughly! Now, it’s completely up to you whether you decide to eat ice cream whilst you’re pregnant – or junk food in general, for that matter. Generally, you want to try and avoid eating junk foods during your pregnancy (easier said than done sometimes, I know!). This is because pregnancy is a fundamental time for your babies growth, and you want to ensure that they’re getting the nutrients that they need. No nutritional benefits for your baby – Eating junk food doesn’t provide your baby with any of the crucial vitamins that they need to develop. Sugary foods with empty calories aren’t going to help your baby develop. Weight Gain – Weight gain during your pregnancy is very normal. But too much weight gain can cause health complications like sleep apnea, so it’s important to try and stay eating a relatively balanced diet. Allergies – Research has shown that your baby may develop allergies depending on the food that you’re eating. So, its important to restrict the amount of fats and sugars in your diet whilst you’re pregnant. Fat – It’s also been heavily researched and proven that if you’re eating lots of fatty foods, you increase the chances of your child developing cravings for fatty foods too! Of course, it’s important to remember that a certain amount of junk food is normal; you don’t need to stop eating anything bad completely! If you want to avoid chemicals, you can always use a maker and make the ice cream yourself. If you really want to eat something sweet during your pregnancy, there are better options than opting for ice cream. Here’s a few that might help you fill those cravings. Protein is essential for your babies health. Calcium is also essential for your babies health. The best way to get a combination of both? Find yourself a relatively healthy yoghurt and consume that as opposed to an ice cream that’s based primarily on fats and sugars. A good idea for this is to opt for a greek yoghurt and add a little honey to help sweeten the deal. Berries are one of the best options you can pick from if you’re looking for some healthy to give your baby. In fact, they’re one of the best options if you’re looking for something healthy to give yourself, too! They’re filled with lots of vitamin C, which is awesome for your babies health and will help you to absorb iron – also essential for your little one! They also have relatively low sugar, so they’re unlikely to cause any spikes in insulin. I’m sure you’re probably fully aware of the <add link>health benefits of dark chocolate<add link> by now. It’s filled with antioxidants, which are great for your body. This makes it a great choice for those who are looking something a little less sweet, but still ultimately super enjoyable. To conclude, it’s easy to see that you can most certainly eat small amounts of soft serve ice cream whilst you’re pregnant without guilt. The main thing that you need to remember is to not to overdo it! I know, it’s much harder said than done, but it is possible. When you’re thinking of gorging on junk food – and by gorging, I mean a tub of ice cream, two whole pizzas and a pack of cookies – then remember that none of those foods are benefitting your child. Things like salmon, sweet potatoes and leafy greens actually provide some nutrients for your child. Try to remember this when you’re reaching for another bag of doritos! Will Sorbet Make Me Fat? People often ask themselves the question; ‘will sorbet make me fat’? This is probably because they know that sorbet is generally made up of only three ingredients; fruit juice, water and SUGAR! It’s definitely one of the more difficult questions for you to answer. If you’re looking to eat some delicious sorbet but you’re on a diet, then it’s important to now the effect sorbet will have on your diet. Will it really make you fat if you eat sorbet every day? Well, the answer is; it depends. Will sorbet make you fat? Whilst sorbet won’t specifically make you fat, you have to make sure that you eat it in normal sized quantities. If you’re eating an entire litre of sorbet every day after dinner, the yes; it might have an effect on your waistline. But if you’re eating sorbet in smaller cup size quantities, then the likelihood is that it’s not going to have much of an effect on your diet. The reason that many people think that sorbet will make them fat is that it has high quantities of sugar. Not only is it made with sugar, but the fruit purees and juices that are used are pretty much all sugar, too. This means that sorbet is super high in carbohydrates. Cutting carbs has commonly been linked with the easiest way to lose weight, which is probably why sorbet has ended up with such a bad reputation. In reality, just because something is super high in carbohydrates and sugars, this doesn’t necessarily mean that you’re going to gain a ton of weight. The majority of people, myself included, are of the opinion that you don’t need to completely cut carbs out to lose fat. It really depends on the amount of calories that you’re eating per day more that anything else. How to eat sorbet and avoid getting fat? Now, that doesn’t mean to say that eating carbs is good for dieting – too many can make it more difficult for you to lose fat, especially if you’re not getting enough exercise. A good way to combat this is making sure you getting at least 15 minutes of exercise every day. This way, you can be sure that they carbohydrates and sugars that you’re eating will be utilized and expended as energy. If we’re to take that into account, then sorbet can actually be a really good option if you’re on a low calorie diet. This is because it’s naturally extremely low in fat – it’s basically just sugars. Because there’s only 4 calories per gram of carbohydrates, it means that even a 500ml tub of sorbet isn’t usually more than 4-500 calories, which can easily be incorporated as part of your diet. If you’re adamant on eating sorbet on a daily basis – no judgement here – then your best option is to maintain a healthy balance in the rest of your meals for the day. If you’re eating a full tub of sorbet followed by half a pack of cookies and a bag of doritos, you’re undoubtedly going to gain weight. If you’re eating a cup of sorbet after your dinner of grilled chicken breast and salad, then no – you’re likely not going to gain much weight from this. Now, it’s pretty clear to see that sorbet won’t make you fat – if you eat it in normal amounts, that is! What I love most about sorbet is that you don’t need an ice cream machine to make it, too! The key to any diet is undoubtedly balance, so strictly eating a balanced amount of sorbet will not make you fat. You may experience some weight gain if you’re eating several tubs of sorbet per day, however! “Healthy ice cream bars”.. is that even possible? Well, yes actually. There are a few different ice cream bars that you can opt for if you’re looking to enjoy something and cut calories at the same time. Depending on what you’re looking for, you can almost definitely find a way to turn your ice cream addiction into something healthy. There are tons of options for finding healthy ice cream bars, whether that be using different variations of ice cream like sorbet and gelatos, or just using skim milk and lower fat cream. You can definitely find a lower calorie ice cream that you can make part of any diet. Here, I’m going to have a quick look with your through these different ice cream bars that you can make part of you and your families diet. If you want an extremely low fat fudge bar – yes, low fat and fudge in the same sentence is possible – then you’ll definitely want to check out some of the products from The Skinny Cow. Their products are specifically made for dieters, so if you want to indulge whilst on a diet, it’s a safe option to go with some of their products. Enlightened undoubtedly make some of the best healthy dairy products around; I’ve been a massive fan for a while now. These ice cream bars are an absolute lifesaver if you’re on a diet. They’re really really low in fat, and really really high in protein – perfect if you’re looking for an ice cream bars you can eat after the gym without feeling guilty. Whilst they’re usually pretty expensive in comparison compared to normal ice cream bars, in my eyes they’re worth every penny. With various different flavors ranging from birthday cake to red velvet, you’re guaranteed to find an ice cream bar that you like. Anyone who knows me knows that I’m pretty big on my health – it’s difficult to stay healthy when you could easily eat copious amounts of Ben & Jerrys every day! If I’m trying to stay healthy, I usually try to avoid ice creams made with lots of dairy cream and opt for a vegan alternative. These coconut bliss bars are made from organic coconut milk and organic agave syrup, so you can be sure that although they might be a tad high in calories, they’re not filled with chemicals and other stuff. If organic food is important to you, then these coconut bliss bars might be a great option for you. Jonny Pops bars are one of the lesser know ice cream bars on the list, though that doesn’t mean they’re any less delicious than some of the more known brands! Starting as just a small company in Minnesota a few years ago, they’re now stored in almost every state around the US. You should check them out on social media (Instagram link), their development as a brand is pretty inspiring! Goodpop bars are a great choice if you’re looking for super low healthy ice cream bars that you can eat on your diet plan. They’re made up of organic ingredients, so you don’t need to worry about them being pumped full of chemicals. Because of the way that they are made and their ingredients, they are naturally gluten free – this means you don’t need to worry about eating these bars if you’re a celiac or have gluten intolerance. There’s a great story behind them too, when a young entrepreneur decided to take a chance in 2009 and produced the glorious Goodpop brand. Cool! When in doubt.. go with Weight Watchers! Whilst I’m not a massive fans of their Candy Bars, these Giant Fudge bars are pretty delicious at only 90 calories a bar (they’re not my idea of “giant”, but whatever). The majority of healthy ice cream bars will tend to go for fully skim milk to help cut calories, with these Weight Watchers bars being a prime example of that. Keeping the calories low is great for diabetes. With less than a gram of fat per bar, you’re able to cut calories down and ensure you can enjoy this treat without any guilt. Julie’s organic Bars have been around for over 20 years now, and their newer recipes are as delicious as ever. Whilst they aren’t technically an ice cream bar, they’re a great choice if you’re looking for a healhy alternative. Julie’s Organic also make ice cream bars, but I couldn’t really include them in the healthy list because well.. they’re not that healthy! (full fat milk, heavy cream and cane sugar won’t get you on this list I’m afraid!). If you’re after something a bit different, then you could opt for something like Eatpops. They produce some delicious frozen bars, even if some of the recipes are a bit different. Now, they are pretty damn expensive I’ll admit, but if you want to feel good about yourself and detox your body, then you could opt for these as an alternative to more unhealthy ice cream. You’re super likely to crave weird flavors when you’re pregnant, and they do come in some pretty.. unique flavors, with Kale being one of their most popular options (I know what you’re thinking.. kale?! Well, try it before you judge it!). You may not have heard of Luvo bars before, but they’re still pretty popular. they’re probably best known for having Derek Jeter as an ambassador! Whilst they aren’t considered to be ice cream bars, they’re still a delicious alternative to ice cream bars. If you’re looking for a yogurt bars that is particularly low in calories, then a Luvo bar might be a great option for you. If you’ve ever been inside a Walmart, you’ve undoubtedly seen these Yoplait bars. Whilst they aren’t going to set the world alight with their taste and texture, they’re a good choice if you want a delicious bars that is relatviely low in calories. I love love looove this idea of using these bars as a summer DIY treat with your kids! You can always use the bars with healthy fruit purees to dip in to liven up the taste a little bit – great fun for the whole family! Okay, the reason that these mini snickers bars could be considered as healthy may be based on the size as opposed to the actual contents of the bar, but it’s still super low in calories and could make the perfect after dinner treat for your kids. Snickers ice cream bars have been a popular choice for a while now as an alternative to fast food ice cream. Whilst they definitely aren’t the healthiest of options, you could do a lot worse if you’re after a quick bite. Yasso Bars tend to range anywhere between 70-100 calories, and whilst they’re not technically ice cream bars, they still offer you the same refreshing feeling. My personal favorite is the Cookies and Cream ice cream bars, which although they’re a little higher than the rest at 100 cals, it’s totally worth it! Yasso have a vast array of other delicious desserts too, so be sure to check them out and see what other kind of delicacies you can devour! Yes yes, you read that right that there’s 290 calories per Rice Dream Bar. That can’t be healthy, right? Well whilst you might think they’re a bit high in calories – and you’d be right in thinking that – the amount of calories in your ice cream bars doesn’t define how healthy it is. This bar is coated with high fat things like nuts and coconut oil, so it’s bound to be on the high side when it comes to calories. This doesn’t, however, mean that it’s unhealthy! Far from it, in fact. If you want a natural ice cream bar, then you should consider this one from DREAM (this is a rice dream, but they make a nice almond dream too!). Everyone know I loooove So Delicious products. This is mainly because they’re made with high quality ingredients, and they taste delicious.. hence the name! So Delicious have a massive array of ice cream bars, made from coconut milk, almond milk.. even cashew milk! Whilst their products might be a tad high on the calories, I can’t deny them from the list when you really consider how much 180 calories is. That’s only two apples, or a bag of chips – so it’s not that bad, right? Much similar to the Magnums that you’ll find dominate the ice cream market in the UK and Europe, Perry’s is a US equivalent that whilst isn’t the healthiest, do keep the calories below 200. They don’t quite have the variety of some of the other ice cream bars that I’ve listed, but this doesn’t mean to say they aren’t as delicious! Give thesePerry ice cream bars a chance; you won’t be disappointed. What makes an ice cream bar healthy, anyway? Calories – First comes first, if you’re trying to lose a few pounds then the amount of calories in your ice cream is undoubtedly the thing that you want to consider. If you can find an ice crea bars that’s under 100 calories, you’re pretty much golden. Low Sugar – Keeping the sugar count low is difficult with ice cream, as a certain amount of sugar is pretty much necessary for it to be made (or a sugar alternative). If you need to, you can always opt for a diabetic ice cream to keep the calories down. Low Fat – Whilst the fat in milk isn’t necessarily bad, especially if you’re opting for a milk alternative like coconut milk, then keeping the fat lower is great for cutting calories. Lack of Chemicals – This is something that people always forget, and it kind of frustrates me! Ice cream doesn’t need a ton of additional ingredients to be made, so try to avoid anything with an abundance of additional chemicals. And if you really want to avoid this stuff, you can opt for a good quality sorbet. Overall, it’s important to remember that ice cream should be eaten as a treat – not all day every day! One of the best ways to ensure you’re not eating too much ice cream is too eat healthy ice cream bars, as they limit the number of calories you can eat to a good amount. You should always make sure that you don’t restrict yourself too much, so don’t hesitate to pick yourself up a nice ice cream bar treat every now and then. Blood orange is an extremely acquired taste, which makes it perfect for a sorbet! The best sorbet flavors are usually tart and strong, which is why blood orange is a great ingredient for a sorbet. Blood orange is called blood orange because of it’s dark ‘bloody’ appearance, with it’s flesh taking on a darker maroon color than your regular orange. I’m sure you’ve had chocolate ice cream before – lets face it, almost everyone has. But chocolate sorbet? This less common treat can be fantastic for those allergic to the lactose in ice cream (some sorbet recipes will use chocolate but you can find some that just use cocoa powder, too). Don’t run away! I know, beetroot sorbet sounds kinda disgusting, right? Well, give it a chance and you might be surprised by how delicious it is. Beetroot sorbet has actually risen in popularity recent after it’s become a staple for posh, expensive restaurants to use it to be edgy. I’m not arguing; I think it’s delicious! Try this beetroot sorbet if you’re after something a little different. Lemon.. and vinegar? Yeah, I know it sounds kind of crazy, but it works.. trust me! The little drop of balsamic vinegar actually offsets the bitterness of the lemon, making this one of the best sorbet recipes in my opinion. Be sure that you don’t overdo it on the vinegar however, otherwise you’ll be in for a rude awakening! Chocolate sorbet shouldn’t work by definition. Sorbet is usually best for sour and tart flavors, which often get lost in chocolate because it doesn’t maintain it’s bitter flavor when mixed with sugar. Usually, if you compare ice cream and sorbet, ice cream works better for chocolatey flavors. However, chocolate sorbet does work. And it works pretty damn well, actually. Especially if you add a hint of fruit in there like cherries, it can make it into something really delicious. Some fruits are best for sorbet, and pineapple is an ideal one for making a sweet dessert that will taste truly delicious. Make sure that you get yourself a fully ripe pineapple to ensure that you’ll get a sweet sorbet. If you don’t then your sorbet may not taste as delicious as it could. You could also serve your pineapple sorbet in the scooped out pineapple itself.. cool! If you’re looking for something with a subtle flavor, then a watermelon sorbet may be your best bet. It’s flavours are not overpowering like some sorbets, so this is a great choice if you have a dinner party and want to please everyone. Using watermelon also allows you to try some pretty cool decoration designs with the outside. You could serve it in the watermelon, or just stick a few slices in the top for some unique looks. Blueberries are one of the lowest sugar fruits around, so it’s no surprise that many people think a blueberry sorbet won’t really work. They’d be wrong! A blueberry sorbetto is one of the better choices if you’re looking for a sorbet flavor that isn’t popular, but will still rocket your tastebuds. Try adding a little lemon to your blueberry sorbet; the high acidity works wonders for your tastebuds and adds a little extra to the recipe. For a more sophisticated sorbet, you could look at something like a cucumber mint sorbet. Actually, this doesn’t even necessarily need to be a dessert and could easily be served in small amounts as an appertizer if you’re having a dinner party. Although mint isn’t usually the best mixture with a sorbet, it seems to work with the subtle mint taste. If, like me, you like to experiment with new stuff and don’t mind having some alcohol with your sorbet, then this strawberry and rose sorbet is perfect as part of a nice champagne concoction. If you really want to get romantic, then this could be a great option for you to treat your loved one to a delicious – and slightly tipsy – dessert! Mint.. and grapefruit? Whilst it might not sound like the best combination, it actually works extremely well. This is because the mint offsets the sharp citrus taste. Make sure to use a fresh grapefruit when you’re making your mint and grapefruit sorbet. This way, you can be sure that you’ll get a crisp taste that won’t be lacking in flavor. I know, I know.. some of these recipes are getting a bit abstract for you! Avocado sorbet? Who’d have thought these two would ever be in the same sentence! An avocado sorbet, to me, highlights one of the main reasons that I love sorbet in the first place.. it’s vegan! Although the recipe I’ve shared doesn’t include this, a cheeky tip of mine would be to add a touch of lime. This bit of zest is sure to liven up your tastebuds a little! I’m partial to the odd glass of wine, and combining it with a sorbet to me is a massive WIN! Whilst you don’t necessarily need to use a Zinfandel with this recipe – you can just as easily use a Merlot – I prefer to use a Zinfandel because it’s my favorite to drink (oops!). Whilst it might not be the first flavor that springs to mind, a Zinfandel sorbet is sure to liven up any dinner party that you have! I found this recipe whilst browing online, and although I haven’t tried it – it looks delicious! It uses and and oat milk, so although it may not technically be a sorbet (I’m very picky about what gets included as a sorbet and this is a sherbet!) it looked so delicious that I had to include it. If you want something slightly thicker and more filling than your regular sorbet, then this may be a good choice for you. Due to the carbs that are in it, I’m sure this one will fill you right up! The strawberry and lime blend is as old as time; they just work so well together! The sweetness of the strawberry works perfectly with the slight citrus of the lime, making this a great choice if you want the best of both worlds. Sorbet is great for keeping the weight down, too. If you’re looking to try something a little different, then this strawberry and lime combo is a great choice. It’s also a great choice for anyone who wants to make their dessert look pretty, too. Although I’m not usually a mango and lime fan, this works for a zingy sorbet that will liven up your tastebuds. If you think you’d like the sweet mixture of mango with the tang of lime, then you could opt for this as one of the best bets for your sorbet. I’ve never truly managed to get on the elderflower train. I prefer something with a little more flavor. But if you want something subtle and elegant, then a elderflower sorbet is the perfect dessert to serve at a dinner party. If you’re looking for a super easy sorbet recipe that’s a little different, then you could opt for a grape sorbet. Because of their high sugar content, grapes make a great choice if you’re looking for something to give you a sugar kick. Check out below for a quick instruction guide on how to make this delicious grape sorbet! Rhubarb and Gin is the combination that nobody asked for, but it just works. If you’re looking to add a little alcohol to your sorbet, then this might be a good choice for you. Just remember not to add too much! I’m a big passionfruit fan, there’s no denying that. And passionfruit makes the perfect flavor for a sweet, refreshing sorbet that’s super easy to make. You can even make this one with pre made passionfruit puree if you don’t want the hassle of making your own passionfruit puree. Thinking outside of the box is a great idea when you’re considering sorbet – there’s a lot of flavors that work in their own right. I’m sure you never thought of making a cantaloupe sorbet before. Make sure to find a cantaloupe that’s sweet, otherwise your sorbet is likely to end up tasting like nothing. Overall, these are just some of the best recipes that you can consider if you’re looking to make a delicious sorbet. Welcome to Uncle Mikes Ice Cream! Hello, I’m Uncle Mike. I’m taking my expertise from 30 years in the ice cream trade and imparting that wisdom onto you! Best Milk Frother | Handheld or Heater for Frothy Coffee? Are there Health Benefits of Eating Ice Cream? What is the best ice cream for diabetics? My Favorite Ice Cream Maker!